I’ve written extensively on how Shopify is truly the easiest way to sell products online, whatever they may be. Because of this, I have used them for tons of different products and companies, and have referred them to friends and family for years because of the simplicity of making an online store. In this guide, we are going to go over how to you can create your very own Shopify website in as little as 30 minutes. Seriously. This guide is not meant for complete beginners and is intended to be cut and dry, short and sweet. If you want to read in depth on how to perform each step of the process, you can read the guide on how to create an ecommerce website from scratch, which will take you through some of the processes outlined below in great detail. 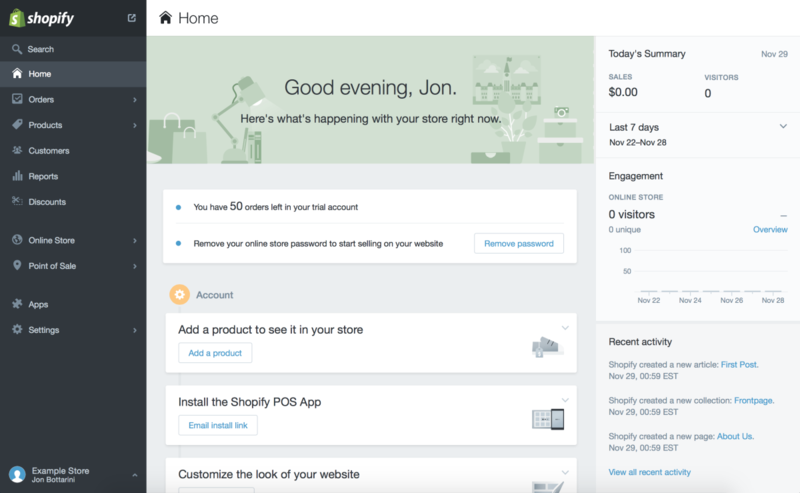 You can also see why I recommend Shopify as an ecommerce platform if you want to read up on why Shopify beats the competition. We may brush over certain topics in this single post but I have sprinkled a ton of links inside to point you to the right post if you want to really expand on a certain part of the guide or if you get lost along the way. So here we go. I have outlined each step of the process as well as the amount of time it will take for you to (probably) complete each task. Don’t worry if it takes you more or less time to complete the following, you should be on track regardless to create your store in less than 30 minutes even if you are not well versed with each step of this process. Web hosting is how your website will exist on the internet. If you don’t already have a web host, I would recommend using BlueHost, because I use them for ALL of my projects and they have been more or less perfect for my needs. They also provide a free domain name with your hosting plan, so you don’t need to go and pay an extra $9-$12. For a comprehensive guide on how to setup BlueHost and your hosting plan, read this post, or move on to the next step if you already have a hosting service and domain name. Note: I recommend using a .com domain name for this project, for these reasons. 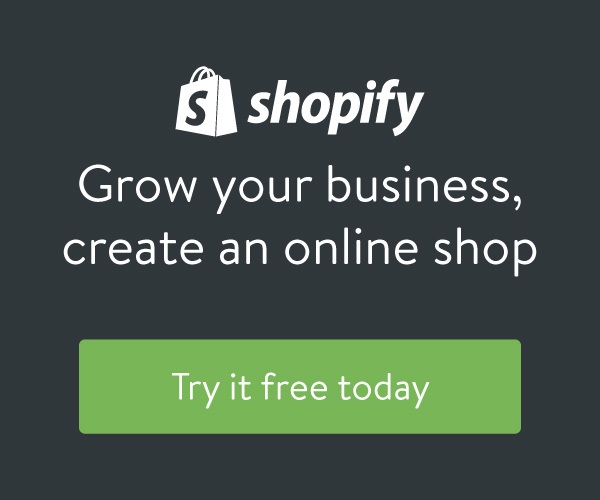 Shopify gives you a free trial that you can test out your idea, all for free. You can register to create a free Shopify account using this link or by clicking the banner below. Once you are on that page it will look like this: Enter your name, email, and storefront name (you can change this later) and you are all set to go! It literally is that easy. Now that you have your shopify store created, you will be sent to the admin console, show below. You have a Shopify store now, congrats! Next step is customizing your theme and adding products. In order to choose a theme and get started customizing – you can on the right hand side and click on Online Store > Themes. The following page will appear and you will be presenting with a wide variety of options. The default Shopify store theme will already be added and applied to your account, so if you want to use that one, that’s fine. In order to modify the way it looks, just click on “Customize Theme”. If you want to choose another theme, you can click on the “Visit Theme Store” button located at the top right hand corner of the screen. 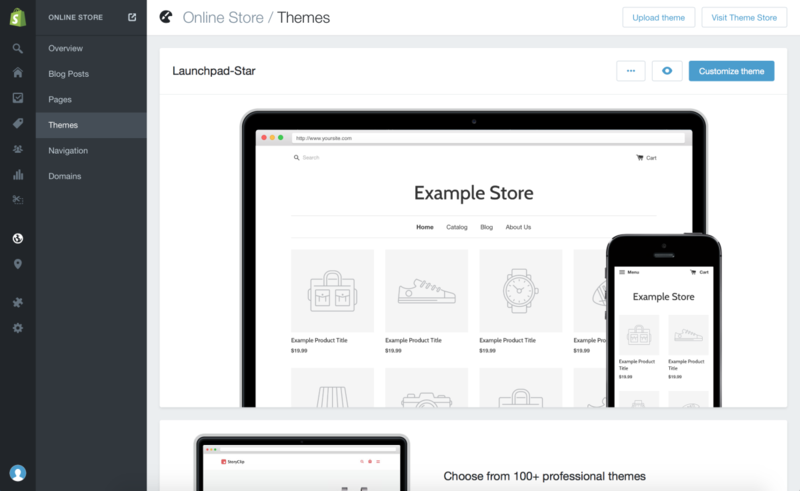 Additionally, check out the list of best free Shopify themes to use. Obviously a lot of time can be spent on customizing your theme and ensuring that it looks nice, but for the most part, you can start selling as soon as you have a product. Shopify has a huge library of resources and videos on how to change your theme, so we won’t be covering that in this blog post. In order to link your domain to shopify, follow the steps outlined here. 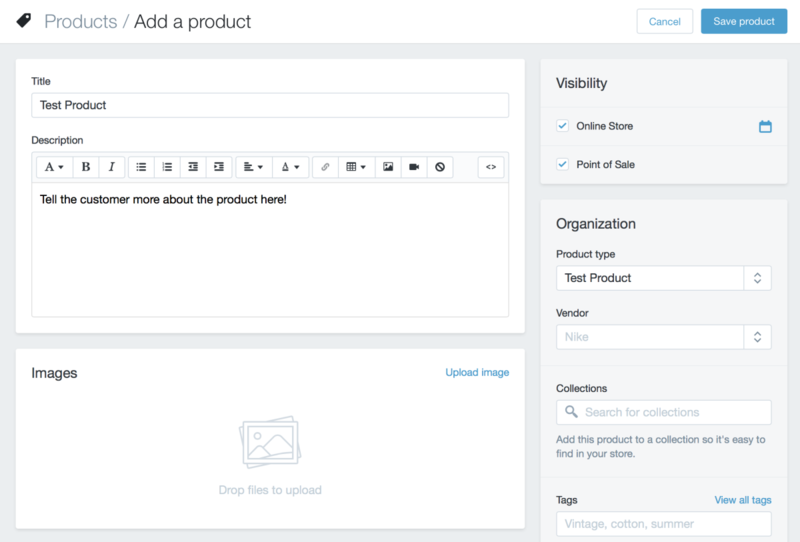 Adding your first product is simple and can be done by going to the sidebar and clicking on the “Products” button. On that page there should be a button that says “Add a product”. The create a product page is simple and easy, you just upload your photo, add a title and content, and set a price. Once you have done the following you can start driving traffic to your site or advertising it to friends and family. Make sure that you setup a contact form and payment option so that you can collect the money once you receive your first sales. Why should you use a .com domain name extension? If you have questions or need a point in the right direction, leave a comment below and I’ll help you out!